So it just keeps getting crazier. On top of moving into a new place, and starting a new job, our daughter was born on Sunday night. I’m taking a little time off and have this absurd idea that I’ll be able to get to the backlog of posts I have in draft on Blogger. Here’s a super simple salad that I served with the Tilapia and Mole Poblano a few months ago. Right now, field greens are abundant in our CSA. So are corn and scallions. At the time, we were also getting a ton of radishes. The most interesting part of this dish is probably the jicama. Most people aren’t famliar with jicama….though it’s the workhorse of any Latin American crudité plate. Crunchy, high in moisture content and very mildly flavored. I think it’s fantastic for moving hummus from plate to mouth. Shaved, it’s also great in salad. 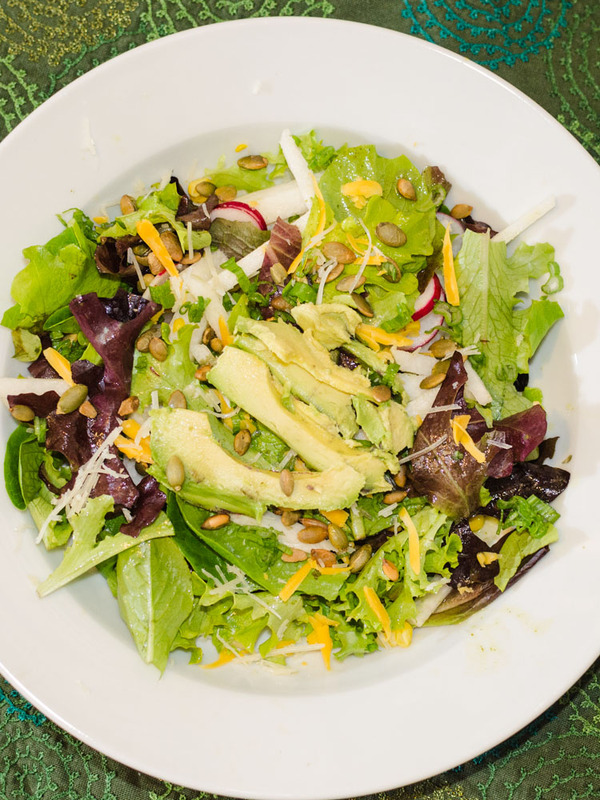 Rounding out the salad are some toasted sunflower seeds, avocado slices and cheddar cheese. Dressing? With all of this Mexican and Latino influence, something cilantro-based would only be appropriate. Check out my Cilantro-Lime Salad Dressing and enjoy!